WASHINGTON — Nearly 100 days into Nancy Pelosi's second tenure as House speaker, she's ticked off several top legislative goals, negotiated the end to a partial government shutdown and hit a few bumps in the road. After eight years in the minority, the California Democrat, 78, took back the gavel in January amidst a shutdown that began in December when Republicans still held control of the House and lasted for 35 days. She previously served as House speaker from 2007 to 2011. 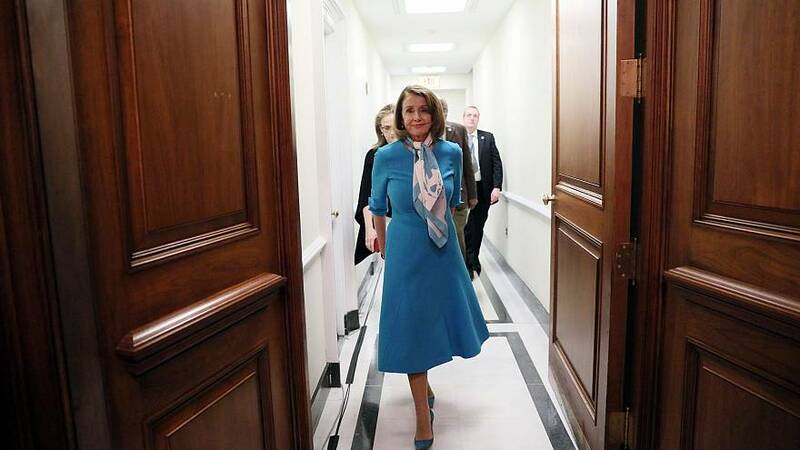 Despite the rough starting environment, current members, former House lawmakers and former congressional aides from both parties as well as outside scholars praise Pelosi for the job she's done as speaker three months in. "I think she's extraordinary," Rep. Charlie Crist, D-Fla., a former Republican, told NBC News, describing her leadership as "incredibly smart and very wise." "I think she's done brilliantly," said Norm Ornstein, resident scholar at the American Enterprise Institute. "The Democrats have had now a formidable individual to face off against Trump, something he has not seen in the first two years of his presidency, and I think it's bamboozled him." Pelosi's own public confidence has been palpable. "Winning is good," she confidently told reporters after she helped bring an end to the shutdown. Former Rep. Tom Davis, R-Va., who served in Congress from 1995 to 2008, said he gives Pelosi "high marks" for staring down the president on the border wall. "She went head to head with the president, basically. He's the one who blinked." Former Florida Rep. David Jolly, who left the Republican Party last year, described Pelosi's performance as "masterful." In the end, all observers say that Pelosi's real test will be defending her majority in the 2020 election. Pelosi's election as speaker wasn't delivered on a silver platter. After the 2018 midterm elections, a group of Democratic incumbents tried to mount an insurgency against her nomination, citing a preference for generational change in leadership. Ultimately, she was formally elected in January with 220 votes. Many of those active Pelosi critics have since abandoned their efforts. Rep. Kathleen Rice, D-N.Y., for example, has voted with Pelosi on nearly every floor vote so far. And another, Rep. Seth Moulton, D-Mass., seems to now be focused on potentially launching a White House bid. Rep. Ed Perlmutter, D-Colo., who's served in Congress since 2007, was among those last year who wanted new Democratic leadership last year. "I was somebody who was thinking we need some generational change and I was pushing that. But I gotta tell you I've been very happy with the way she led our caucus so far," he said. Pelosi came into the position this year with a much more diverse caucus, with 67 freshman members elected in November, including a number of millennial members who haven't been afraid to speak out against leadership. "Welcome to the Democratic Party," Pelosi told reporters at a February press conference in response to the criticism. "We are not a rubber stamp for anybody. We are not a monolith; we never have been." Freshman Rep. Alexandria Ocasio-Cortez, D-N.Y. has attracted national attention since her surprising primary upset over longtime Rep. Joe Crowley, D-N.Y., last year. In the wake of the midterms, she joined young protestors and inside Pelosi's Capitol Hill office in November to demand action to combat climate change. Since then, "AOC," as she's often referred to, has refrained from criticizing the House speaker, even telling NPR in February that Pelosi is "doing a great job" and complimenting her ability to "hold the caucus together" during the shutdown. Democrats have a diverse caucus ideologically and geographically, said former Rep. Steve Israel, D-N.Y. "I've likened it to [Arturo] Toscanini conducting a jazz orchestra. She's got this cacophony and she makes it sound like harmony." Pelosi recently had to deal with the controversy surrounding remarks that Rep. Ilhan Omar, D-Minn., made about Jewish lawmakers and Israel that many considered to be anti-Semitic. Initially, Pelosi had planned to put a simple resolution on the House floor condemning anti-Semitism, but that plan sparked an uproar among some members who eventually won a more all-encompassing measure that passed the House and condemned hatred against a range of minority groups. Pelosi and Democratic leaders have also been blindsided several times this year by Republicans' use of a procedural tool to force floor votes on issues of their choice called "motions to recommit." The votes have produced a number of Democratic defections. GOP leaders forced one vote condemning anti-Semitism and another on a measure that would seek to report undocumented immigrants to undergo background checks to Immigration and Customs Enforcement. "Pelosi of all people should be better at sniffing [out these MTRs] because Republicans did it to her the last time they were in the majority," said Rory Cooper, who served as Cantor's communications director when he served as House majority leader. "Under [John] Boehner and [Eric] Cantor, there were a ton of MTRs that caught the Democrats flat-footed. And Pelosi was there for that." Floor votes, however, are typically managed and overseen by the Democratic majority leader and whip offices. Pelosi has made her preference known for how Democrats should proceed. "I think you should just vote against all Motions to Recommit. It's a procedural vote. It's a gotcha on the part of the opposition. Let's make life easy, just vote against them," she said at a recent press conference. Israel dismissed the procedural headaches. "I may be out of Congress for now going on two years, but I guarantee an election will not be won or lost on a motion to recommit," he said, and added, "Welcome to leadership...you can't possibly anticipate all of the variables that will confront you." Members from both sides of the aisle and most outside observers have commended Pelosi's cautious approach to a possible impeachment effort against Trump. She recently told The Washington Post that impeaching him might not be "worth it"because it's such a divisive issue. "You don't want to give the president the sense that all Democrats care about is impeachment because that is not the case," said Pelosi's former chief of staff, Nadeam Elshami. Former Rep. Crowley, D-N.Y., who served as chairman of the Democratic caucus in the last Congress, noted that this isn't Pelosi's first experience with impeachment demands: they were there during her Bush-era tenure, too. "...But unless the evidence rises to what would be deemed as an impeachable offense and go into the support of Republicans, she knows that [launching proceedings] is futile because she needs to have Republican support, certainly in the Senate, to make that happen," he said. While former Rep. Jolly said Pelosi has shown "remarkable savviness politically" on the issue, he said that impeachment may not require a public buy-in. Democrats already have a case to work off of, he said, and should already open an impeachment investigation. "I mean Donald Trump was named in a criminal conspiracy and in this case what is different than with past presidents [is], it's been entered into judgment by a federal judge," Jolly said, referring to the plea deal involving Trump's former lawyer Michael Cohen by prosecutors in the Southern District of New York. "I think at this point, I think it is inevitable they impeach," added former Rep. Davis. Capping off months of work, Democrats passed their top legislative priority in early March: H.R. 1, a bill that would, among other things, expand voting access and revamp ethics regulations, including requiring presidential candidates to release their tax documents. In late February, with just a handful of defections, Democrats overwhelmingly passed two background check bills that would expand federal background checks to private gun sales and chose the so-called "Charleston loophole" which allowed the shooter in Charleston, S.C. to buy a gun and kill nine members of a church in 2015. Neither of these legislative packages is expected to be taken up in the Republican-controlled Senate. Other pending legislation includes one to lower prescription drug prices, and another focused on promoting equal pay for men and women, which the House will vote on next week. Democrats are also aiming to craft an infrastructure package, possibly by the end of May. Once Democrats complete their slate of messaging bills, appropriations will dominate the rest of the year, including a larger negotiation this fall over lifting spending caps for two more years and raising the debt ceiling. The final grade on Pelosi's session report card, Davis said, will be determined less by what happens in the lower chamber and more by what happens in districts across the country — by whether she can hold the House next year. Then again, "to hold the House you've got to hold the moderate members from swing districts," he said. "Getting things done helps them." In the meantime, a big focus for the remainder of this session will be striking the balance between the more progressive members who are becoming the face of her caucus and the more moderate members who make up its majority. "If you're a Democrat in a D 1 or R 1 district, you're probably not happy with what you have to defend at town halls back home," said Cooper. "One of the speaker's jobs is to keep the majority, and in order to do that, you need majority makers — and they are Democrats winning moderate districts."